passengers a day. 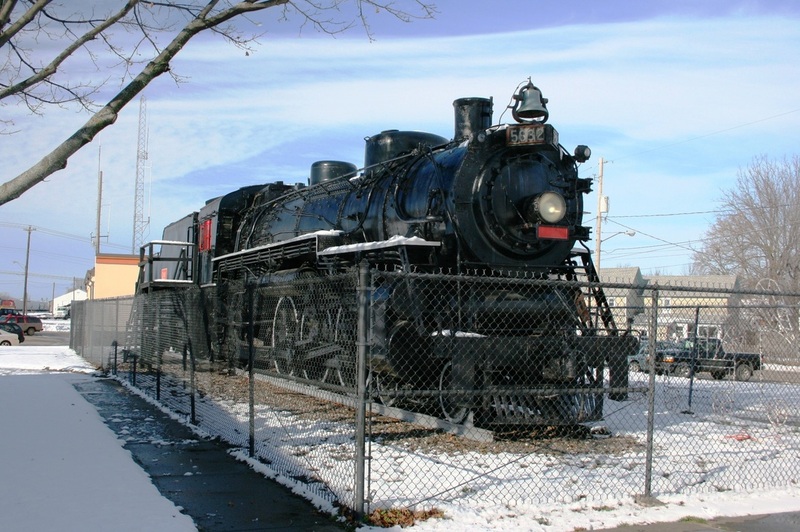 The station was added to the National Register of Historic Places on June 6, 1971.
to serve as the home of the Michigan Railroad History Museum. 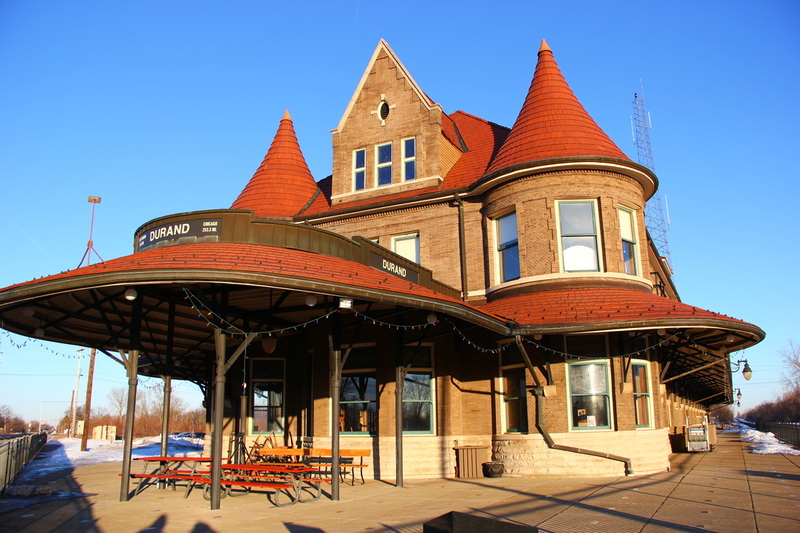 It is a popular viewing location for railfans, and houses a model railroading club, a ballroom, and a gift shop. During the Durand Railroad Days Festival in May, a lunch counter operates in the station, reminiscent of its glory days. 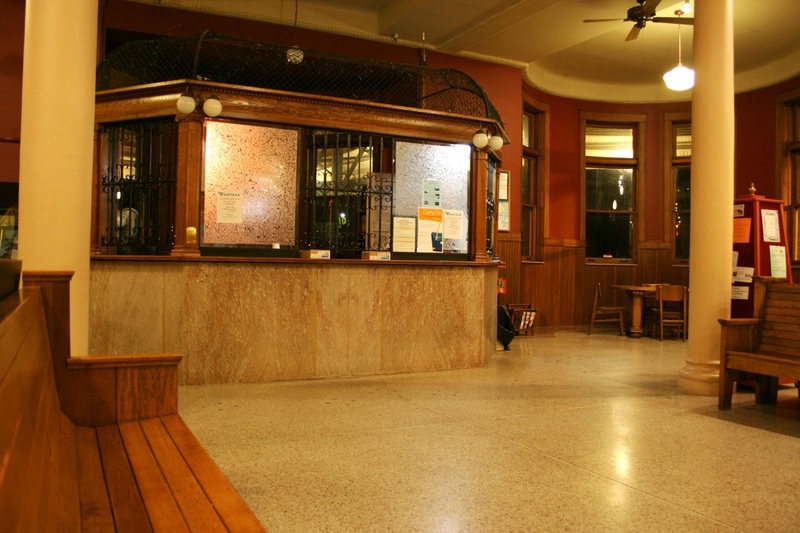 In 1981, Amtrak once again began using the station building as a waiting room. This un-staffed Amtrak stop is serviced twice daily by Amtrak's Blue Water (trains # 364 and # 365). 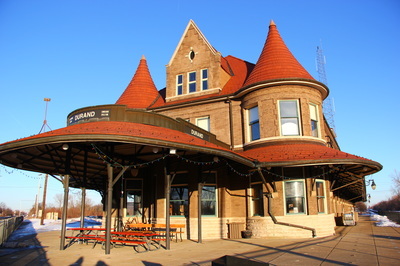 Amtrak's station code for Durand is DRD. Note that even though Durand is referred to as a "city", it’s really a small town with a population of less than 4,000. 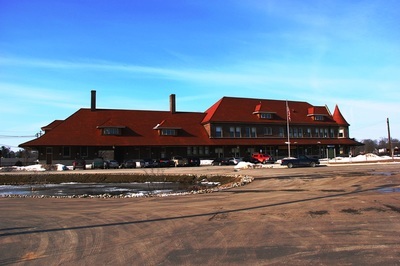 There is not a motel or car rental location near the station. As a matter of fact, Durand didn't really have lodging until Quality Inn built a motel on the other side of town a few years back. Its a few miles away from the station, near I-69. My opinion on Durand. There are only around 20 trains that pass through Durand during a 24-hour period; most of those are CN freights. Some say the number is higher, but I've never seen it, maybe I've just been there on slow days? I don't know. There are plenty of busier train-watching spots a few hours south of here on the NS / CSX (i.e., Berea, Fostoria, Deshler, OH, and Elkhart, IN). Why do I keep returning to Durand? Atmosphere! The trade-off between lots of trains and just a nice, quiet place to watch trains! The station is beautiful inside and out, there are picnic tables outside, a warm waiting area inside the station, or you can just sit in your automobile and wait for the passing trains. For those who like to bare the outdoors, approaching trains can be seen from the platforms well in advance from three directions. The fourth direction (west from Chicago), you can listen for distant train horns. Durand itself is a quiet zone, so keep an eye on the other three lines. Another draw to this line is the traffic mix on CN. 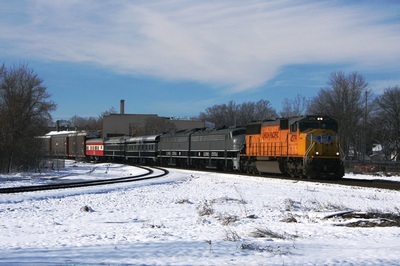 For those of you that spend a lot of time railfanning CSX, NS, UP and BNSF, I find the train consists vary on this line. Most of these trains are going / coming from Canada. 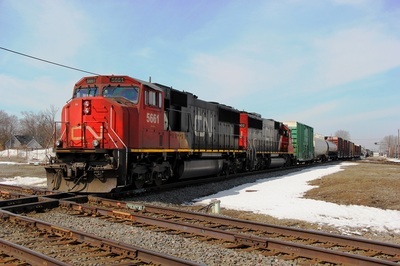 Beside seeing a lot of CN owned cars that usually don't leave their system, double stack trains also have a large amount of CN containers and other thing's you don't usually see in the rest of the US. By the way, if you think you will only see CN owned locomotives here, think again. Every time I visit Durand, coal trains (and empty hopper trains) are powered by either Union Pacific or BNSF power. During my most recent visit in December 2011, I was lucky to have seen the Illinois Central business car train powered by IC 101 + 102, with 3 passenger cars (2 IC paint, the 3rd CN paint). Amtrak (Blue Water # 364 / # 365, both daily). A freight yard used by all three freight carriers is just north of the station. Rail Traffic: Expect 20+ train's during a 24-hour period. Two Amtrak passenger trains that normally operate double ended (engine on each end of the train). The rest are freight. 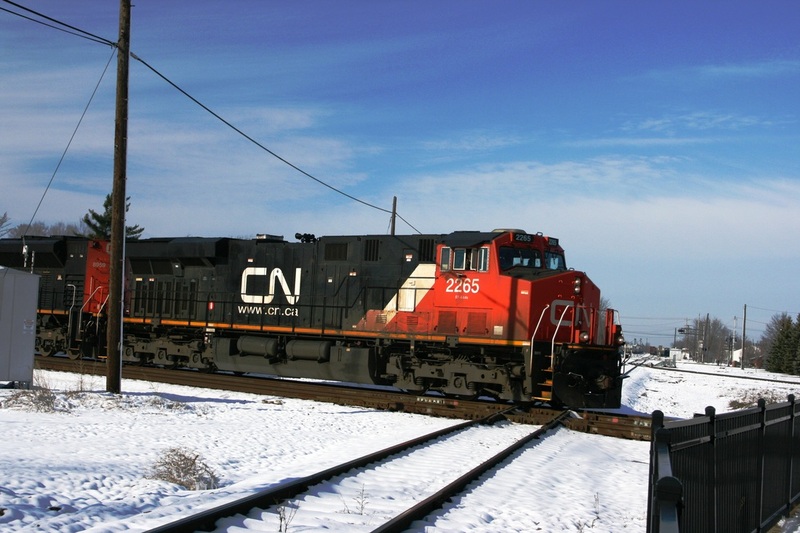 CN trains operating on the GTW mainline move fast. For safety, protected by a 4-foot high iron fence. 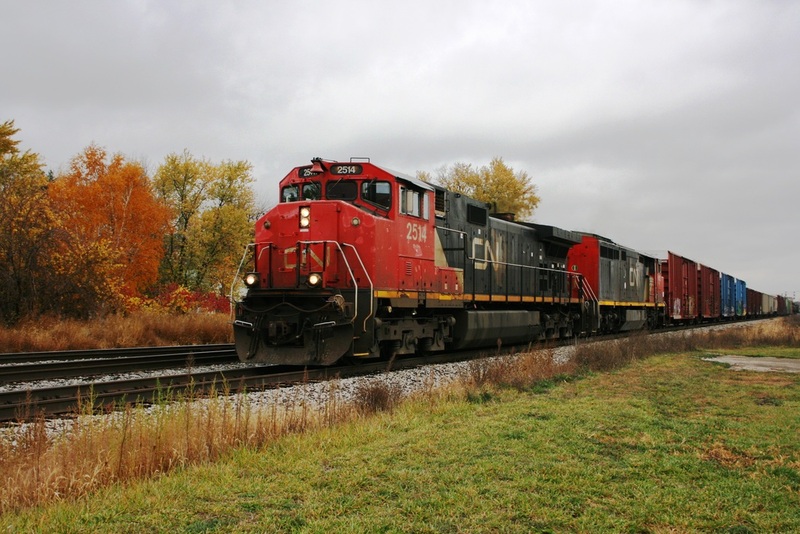 It’s not a big deal to photograph passing trains. Site Details: Train watching from the low level platform around two-sides of the train station. The diamond (2 tracks x 1 track) cross at the station, corner of the platform. Three connecting tracks on three of the four sides of the diamond are all viewable from the station, one of which runs in front of the station next to the parking lot. 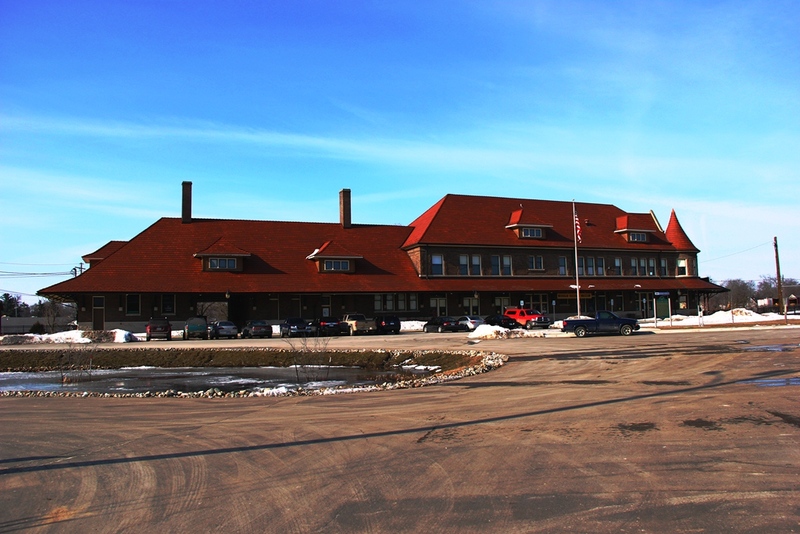 Station building has a restored waiting room, and home to Michigan Railroad History Museum which will explain any questions you may have. There is also a small gift shop. Food: None on site or within walking distance. A drive to downtown to a couple of sit down restaurants, or a drive near I-69 will find a few fast food restaurants (Hardees’s, McDonalds, Subway). Picnic Area: Yes, Picnic tables located outside the station. Lighted for eveing railfanning: Yes. (not sure if the lights stay on all night). 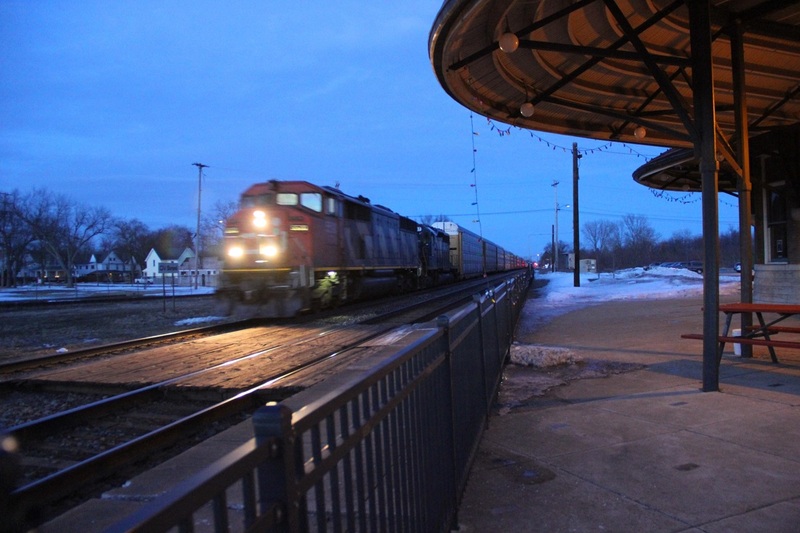 Motels / Hotels: There are no railfan motels in or near Durand. The closest motel is a Quality Inn located next to I-69 Durand exit.